For about a fortnight now, the Maldives has been the major topic of discussion in the corridors of the South Block, which houses the ministries of defence and external affairs in Delhi. 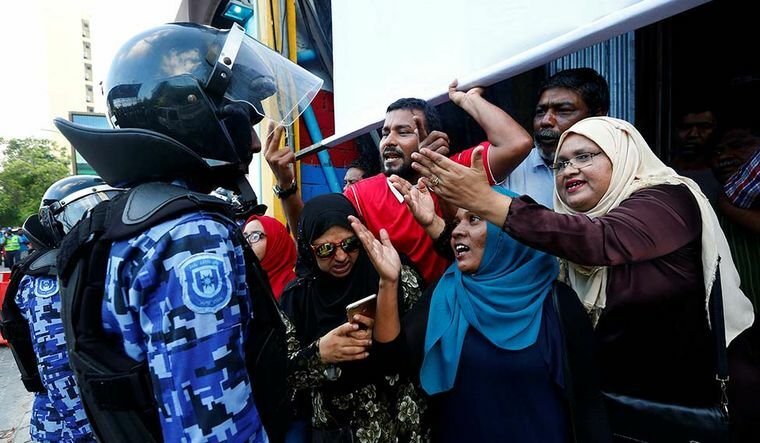 The island nation plunged into crisis after President Abdulla Yameen Abdul Gayoom defied the supreme court order to exonerate 12 MPs, including former president Mohamed Nasheed, and imposed emergency in the country. While the MEA is working on a diplomatic solution, the defence ministry is considering multiple options, including a possible military intervention. At the moment, however, India is on a ‘wait-and-watch’ mode. A defence ministry official said although a military intervention might escalate tensions in the region, it would send a message to regional powers like China and Pakistan that India had the right to act in its own interest. Various options are being explored, including airborne and ground operations. At the Yelahanka air base near Bengaluru, Boeing C-17 Globemaster and C-130J Super Hercules military transport aircraft are on standby to dispatch Special Forces along with tanks and mortars to the Maldives, within hours of receiving orders. A fighter jet sortie, flying low in the Maldivian airspace, is also being considered. The Mumbai-based Western Naval Command has already moved a fleet of frigates and corvettes to the Kochi naval base, which is the closest to the Maldives. Chinese satellites may have picked up movements of ships and transport aircraft, which could be the reason behind the Chinese foreign ministry’s appeal to India to not intervene militarily. Government sources, however, refused to confirm whether the manoeuvres were routine or linked to the crisis. “The developments in the Maldives are a cause of concern for India. Quick and timely action is required. India has always been in the forefront to help the Maldives,” said Lieutenant General (retd) Vinod Bhatia, who had participated in the 1988 Operation Cactus as a young major. India chose to intervene two decades ago following the Maldivian government’s appeal for military help against a coup attempt. “We helped the Maldives when others like the US, Soviet Union, Pakistan and Sri Lanka were hesitant to act. But, we went there only after the Maldivian government requested us,” said Bhatia. This time, however, such a request has come only from Nasheed. Nasheed was the first democratically elected president of the Maldives. But he was forced to resign in February 2012, and in the 2013 elections, he lost narrowly to Yameen. Nasheed, 50, has been living in exile in London and Colombo since 2016, after he was sentenced to 13 years in prison on terror charges. Under Yameen, the Maldives has been growing closer to China. Expressing serious concern over the growing Chinese presence, Vice Admiral (retd) Shekhar Sinha, who was heading the Western Naval Command when Nasheed was ousted, said the Navy was then almost ready to act. “Indian diplomacy, however, made the biggest mistake by accepting the new government. Now, China has intruded into the island nation,” he said. China has warned that it would retaliate if New Delhi decided unilaterally to send troops. It has, however, indicated that it is in touch with India and did not want the issue to become another flashpoint between the two neighbours.